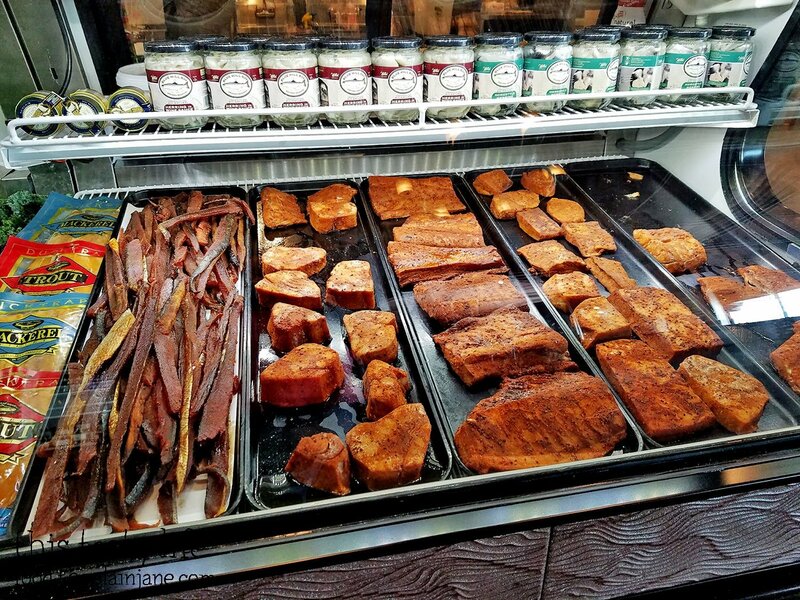 I’m slacking on posting my visit to Fishmonger’s Market from LAST MONTH. Bad slacker blogger. Bad! Let me make it up to you by showing you photos of delicious food. Cool? Cool. So, yeah, I was invited by Christina M. from Alt Strategies to come on down with her for happy hour at Fishmonger’s Market. I had never been here before. 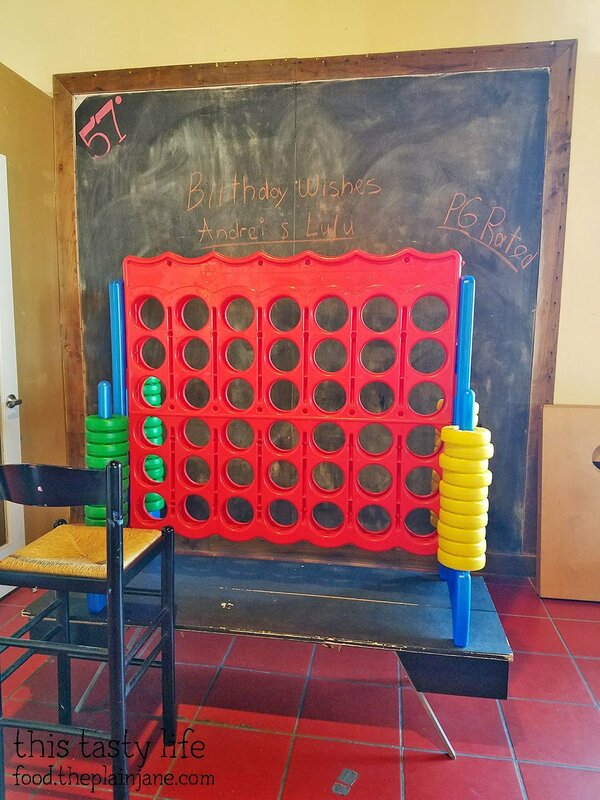 It’s merged with 57 Degrees Wine bar which is this gigantic space with lots of cool thing like this GIANT Connect 4 game. I was really tempted to take a minute just to slide a few markers in… alas, I did not. 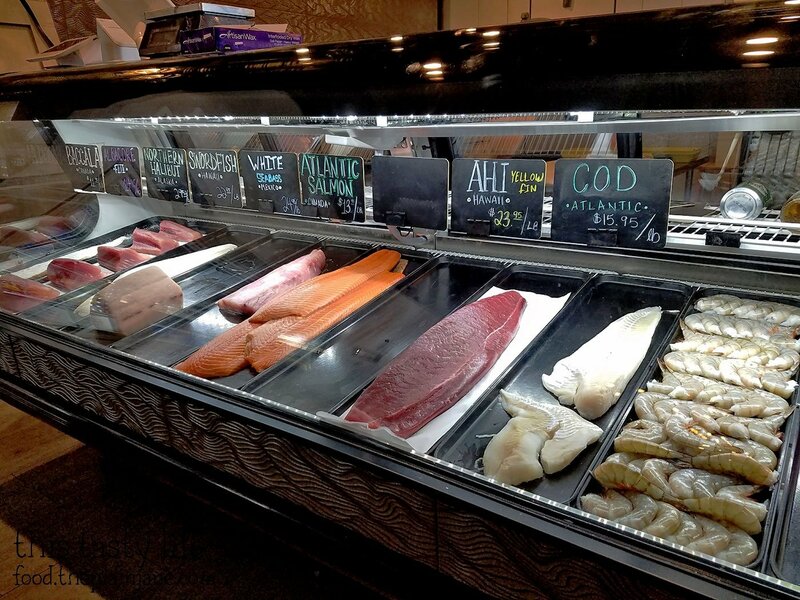 I did peek in at the market side of Fishmonger’s and looked at their fresh fishes and giant shrimp on display. Along with a big variety of smoked fishies. Christina and I started the meal off with some complimentary bread. 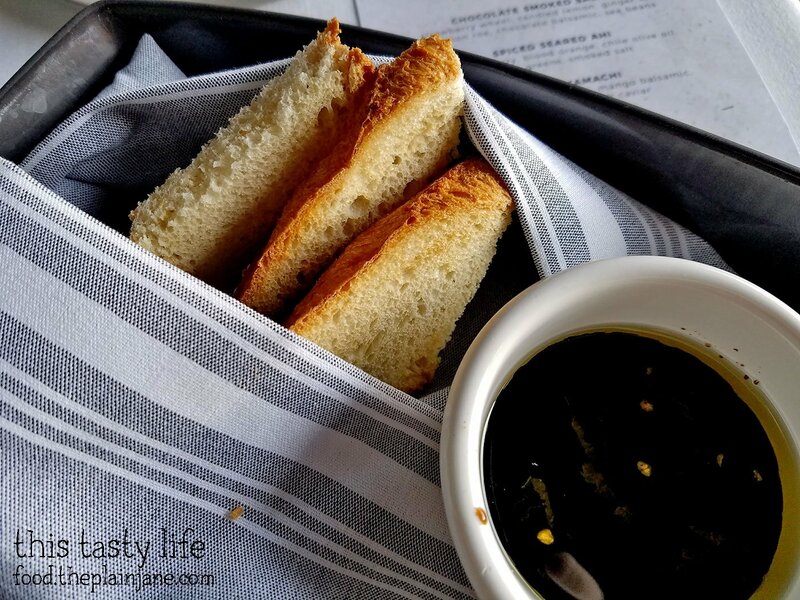 Olive oil and balsamic truly is the perfect bread dipping sauce. I love the stuff. We did a bit of a “Chef’s Choice” thing and this beautiful plate of crudos and poke was brought out for us to sample. Crudo is not something I would normally ever order on my own. But I was going with the flow that evening and trying new things! One item from the Crudo menu that we sampled was this Grilled Octopus. 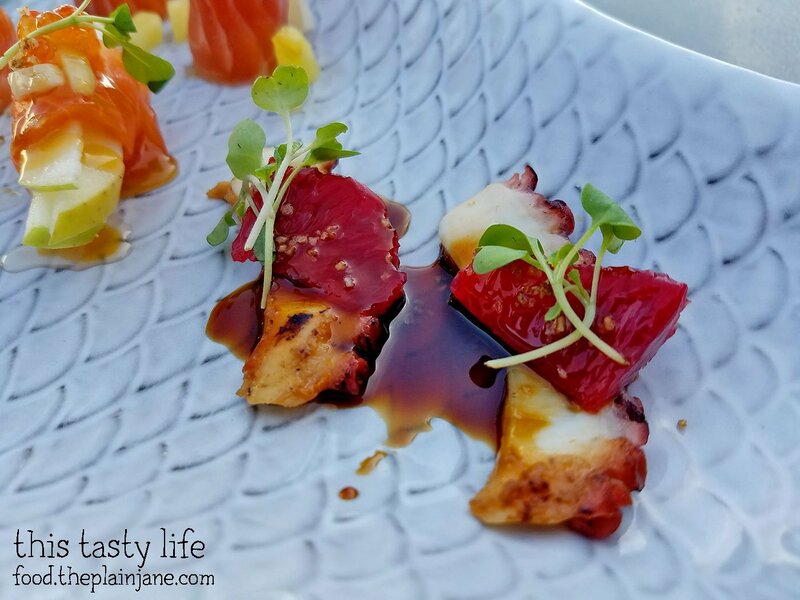 On top of the tender octopus is some blood orange with wasabi greens, a raspberry balsamic, and a sprinkle of habanero salt. I was surprised at how tender and soft the octopus was. The blood orange gave it a citrusy flavor and that punch of habanero salt kicks up the taste buds in your mouth with a little kick! Two things here. The first one I’ll talk about is in the back and it’s called the Jamon Salmon. Inside the piece of salmon there’s a bit of serrano ham (jamon! ), along with onion, pineapple, sriracha, hot honey, salmon roe, and mint. These are all things that I would not necessarily put together into ONE THING. But holy smokes did that bite of food really WORK. And…. can I also just say… I’m not a super big fan of salmon. I mean… it’s okay. I know people love the stuff but I’ve always been kind of “ehhhh” about it but hot damn if that wasn’t a tasty bite of food. The flavor of the jamon played off the salmon so well and you had the sweetness from the pineapple and then some spice from the sriracha and hot honey with this bright bit of mint mixed in. DAMN TASTY, I tell ya. And that’s coming from a not so big fan of salmon. The other crudo was incredibly surprising to me. 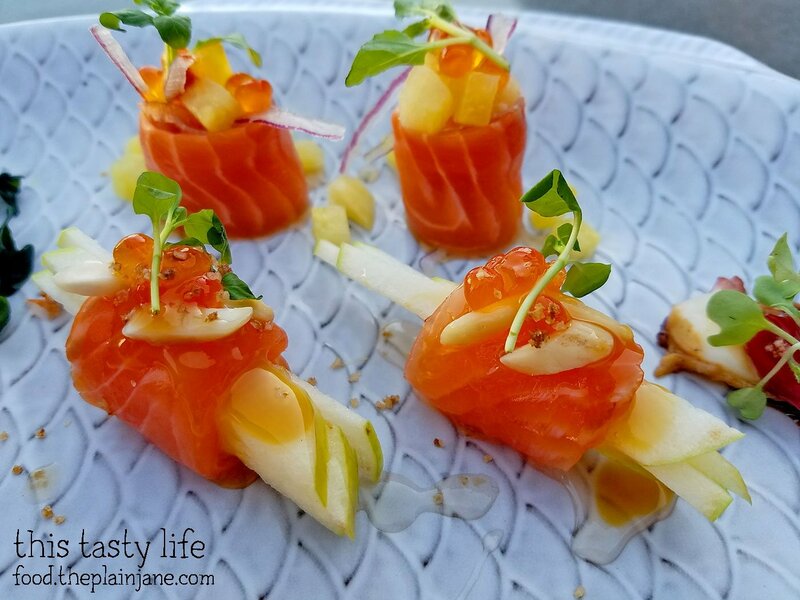 It was a Caramel Apple Salmon Crudo. Ummm, hello? Did you say CARAMEL APPLE? With salmon??? This list seems completely bonkers. But I put that whole thing into my mouth and experienced an incredible explosion of flavors! There’s a crunch and sweetness from the apple, then a bit of acidity (also probably from the apple and the lemon), then there’s a bit of spice coming at you to mix you all up. Then you chew some more and it’s sweet again and you get a crunch from something else and you’re taste buds are kind of delighted and confused and surprised all at once. And that was what it was like eating THAT crazy crudo. I mean crazy in the best way possible, too. A creation of a true genius, I gotta tell ya! I would totally eat it again just to experience that crazy explosion of flavors again! It seemed like every chew gave you a different flavor profile and I loved that! 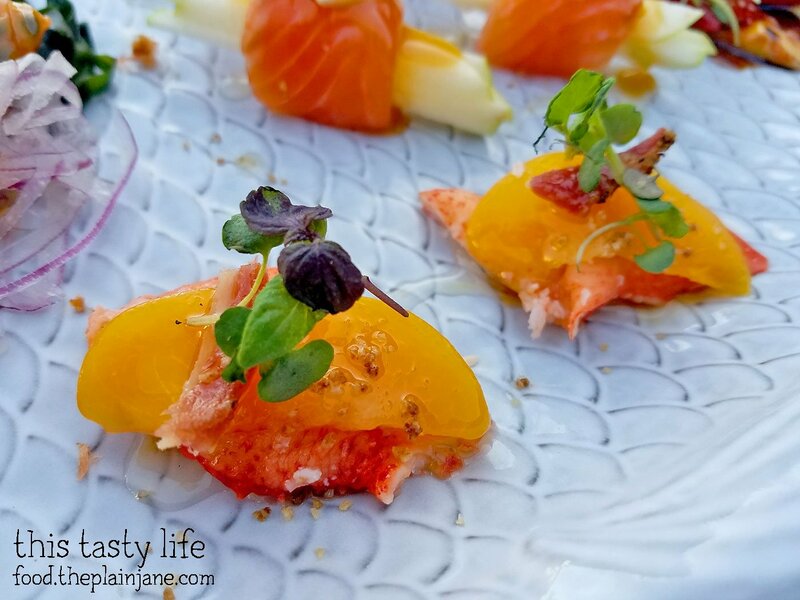 We also had this Peach Lobster crudo. I loved the color on this! That peach looked so deletacle sitting on top of that bite of lobster. This one had peach, pancetta, peach balsamic, hot honey, micro shiso leaf, and more of that spicy habanero salt. The lobster was sweet and tender and the peach tasted really awesome with it. I would have never thought to have fresh fruit with seafood like this! 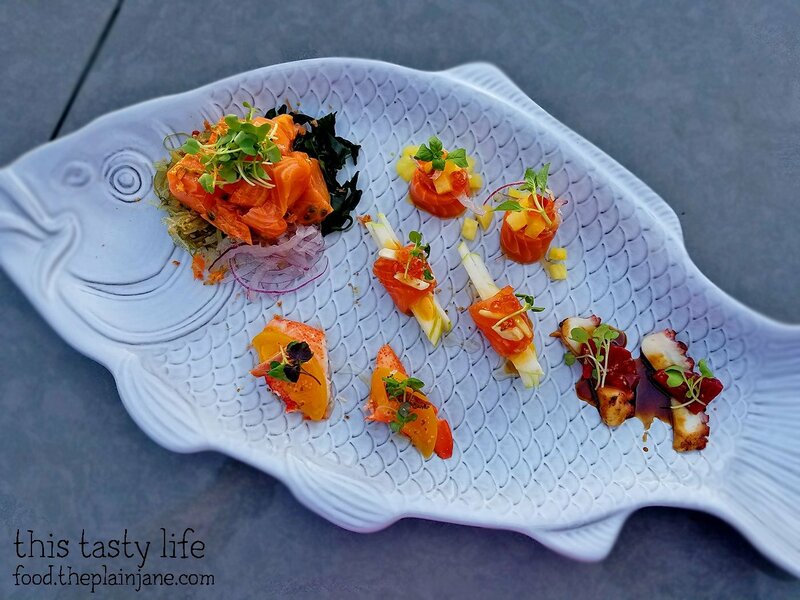 The only thing I didn’t care for on that pretty plate was the poke. Just not my thing! Sorry, poke, I do not love you. Don’t take it personally. 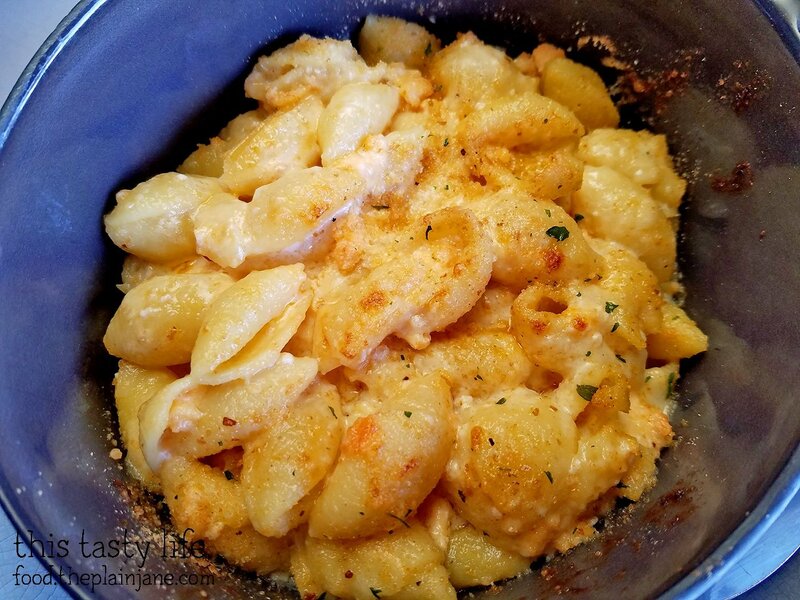 We also got an order of Lobster Mac n Cheese [$15.85] like I could EVER say no to that. Not this girl! 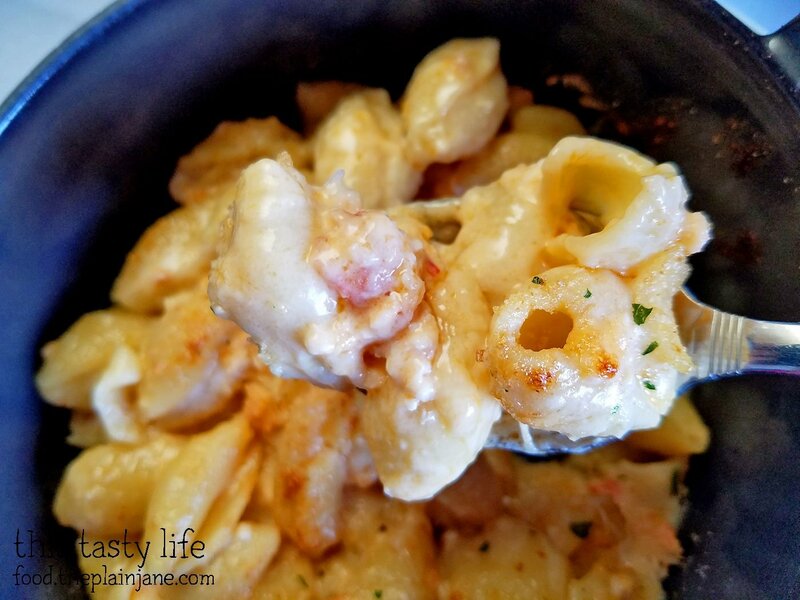 The lobster mac n cheese is made with emmental and jack cheeses. Here’s a spoonful with a nice large chunk of lobster meat in there. The lobster chunks are large and plentiful so there is NO mistaking that this is a lobster dish! I loved the creaminess of this dish and the pieces of buttery, sweet, tender lobster tucked in with the shells. 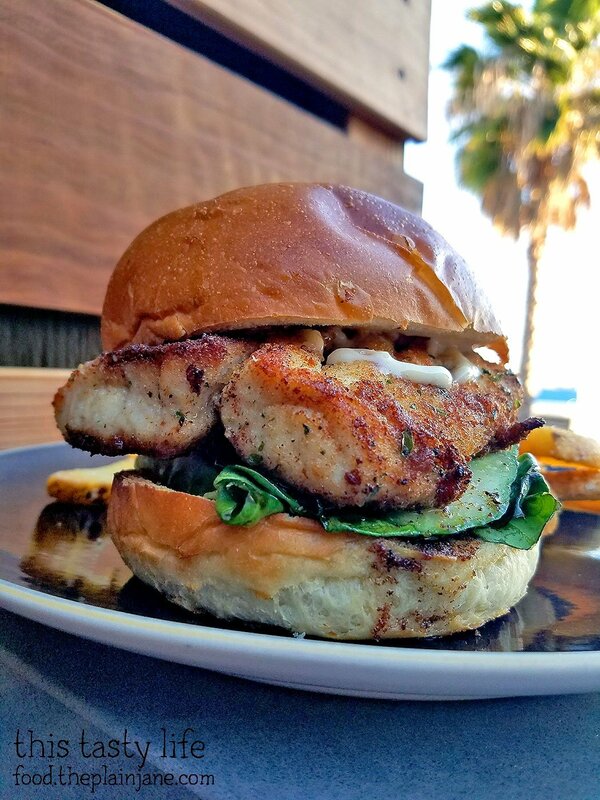 The other thing I asked to try was their Pan-Seared Seabass Sandwich [$16.95]. I was on a seabass kick recently and this sounded SO GOOD to me. The seabass was cooked perfectly – tender, flaky, with a nice outer crust to it. It was served on a nice toasty roll and I was quite in love with this sandwich. I mean, I only managed to eat a bit of it since I had alllllll that crudo and mac n cheese, so you can’t really blame me, but I loved having a few bites of this tasty sandwich just the same. Seabass is probably one of my favorite fishies so this was a nice treat! And even though you can’t see them in this photo, the fries were on point, too! They were nice large cut steak fries, mmmmm. At the end of our meal, we were treated to a little chocolate feast from the management at Fishmonger’s. 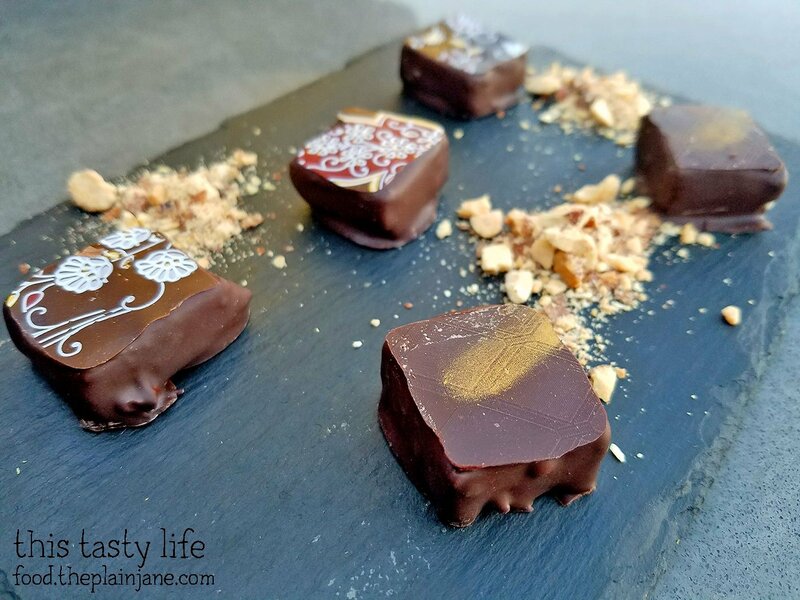 These are hand painted hand made chocolates from Nola Rose Chocolates in La Jolla. The chocolates were quite the treat and a perfect way to end the evening. I don’t even remember what all flavors we had but the chocolates were luscious and I’d eat them again in a heartbeat. Plus they were SO PRETTY. 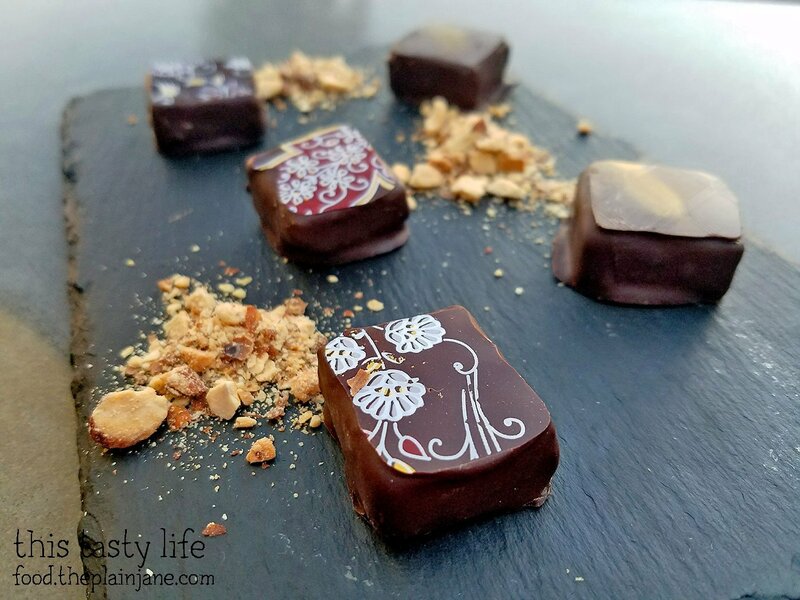 The patterns on the chocolates and that little flourish of gold really made it feel like I was eating something extra special. I had a great time hanging out with Christina and meeting Chef Frankie “The Bull” who came by and chatted with us for awhile as well. It was a perfect evening with great conversation, great food, and sitting out in beautiful San Diego weather on the patio. I would totally revisit with some of my seafood loving friends who I know would enjoy this spot! 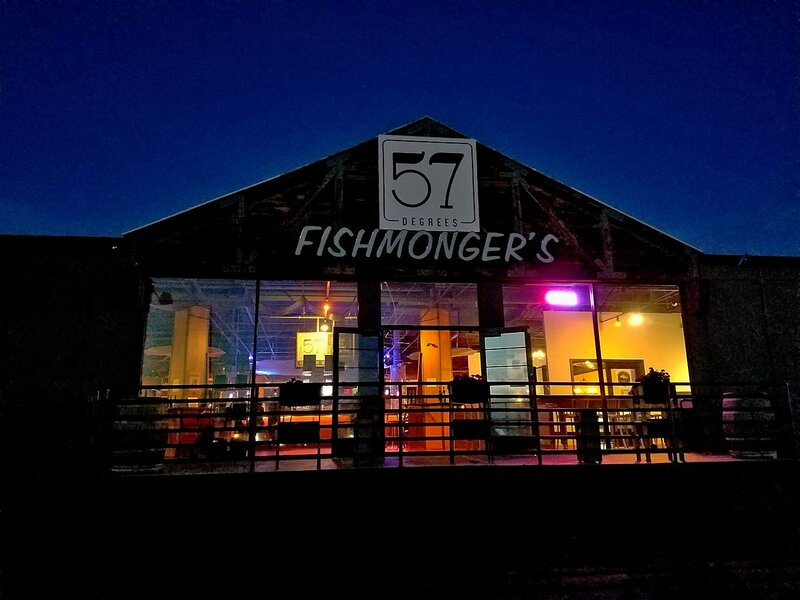 *Disclaimer: I was invited to dine at Fishmonger’s Market. My meal was complementary and I was not further compensated for this post. All opinions stated here are my own. That seabass sandwich looks epic! The seabass sandwich was really good! Excellent texture, good flavor, and the steak fries were awesome! Everything you tried looked so interesting. I liked that the fresh seafood was paired with fruit…That is something I haven’t tried before. By the way, that space used to be the Pier 1 Imports outlet store. At least they have their own parking lot. I felt really adventurous with this meal! It was fun trying new things! I totally remember when it was a Pier 1 Imports. It was some other restaurant for a while I believe before it became this spot.